ABCC is the First Exchange to Add TRON's TRC-10 Tokens -- Can the Positive News Push TRX Above The Current Trading Range? 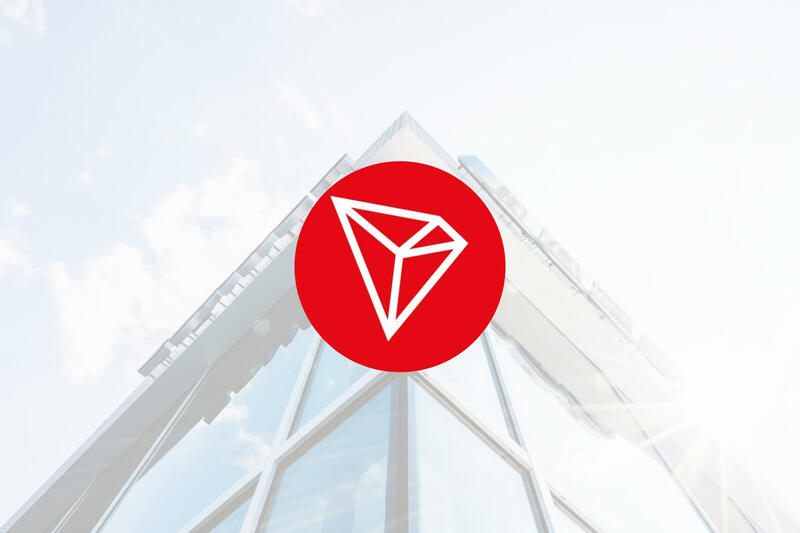 ABCC is the First Exchange to Add TRON’s TRC-10 Tokens — Can the Positive News Push TRX Above The Current Trading Range? TRON has been added to the OKCoin and ABCC Exchanges. The market is currently trading in a range between $0.02698 and $0.02150. Support moving forward: $0.02424, $0.02150, $0.020, $0.01760, $0.01488. Resistance moving forward: $0.02698, $0.02855, $0.030, $0.03140, $0.035, $0.03930 $0.04053, $0.04300. The partnerships with exchanges continue to grow for TRON, as ABCC Exchange has announced a new collaboration with the blockchain project. It all began on January 10, 2019 when ABCC announced that they were exploring the addition of TRC-10 and TRC-20 tokens to their exchange. As of January 15, 2019, it seems that ABCC has started to make good on their word as they announced that they are adding 10 TRON tokens to their platform. They will be the first exchange that will list tokens on TRON’s TRC-10 standard. The TRC-10 standard is a technical standard for tokens that is supported by the TRON blockchain but without the need for the token to deploy the TRON Virtual Machine. It will be safe to assume that ABCC Exchange will keep to their word and add TRC-20 tokens in the near future. The TRC-20 token standard is similar to the TRC-10 token standard but it uses the deployment of the TRON Virtual Machine. This allows TRC-20 tokens to execute smart contracts. It also worthy to note that the TRC-20 tokens will be fully compatible with the Ethereum ERC-20 token standard as the TRON Virtual Machine can support the Ethereum Virtual Machine also. Adding further to the listings to exchanges, OKCoin, the Hong Kong-based crypto exchange, has also announced the addition of TRON on their exchange. The blockchain that can reach a transaction per second rate of 2,000 will be listed on the exchange from January 17, 2019. Traders will be able to trade TRX with USD, BTC and ETH. Let us continue to take a look at price action for TRX/USD over the short term and provide some areas of support and resistance moving forward. TRX has seen a small price decline totaling -3.96% over the past 24 hours of trading, bringing the current trading price for the cryptocurrency down to $0.02467, at the time of writing. The cryptocurrency has seen a further 8.49% price drop over the past 7 trading days but is up by an impressive 85% over the past 30 trading days. TRON is now ranked in 9th position as it currently holds a $1.92 billion market cap value. It sits $270 million in market cap value behind 8th ranked, Litecoin. The 16-month old project is now trading at a value that is 90% lower than the all-time high price. 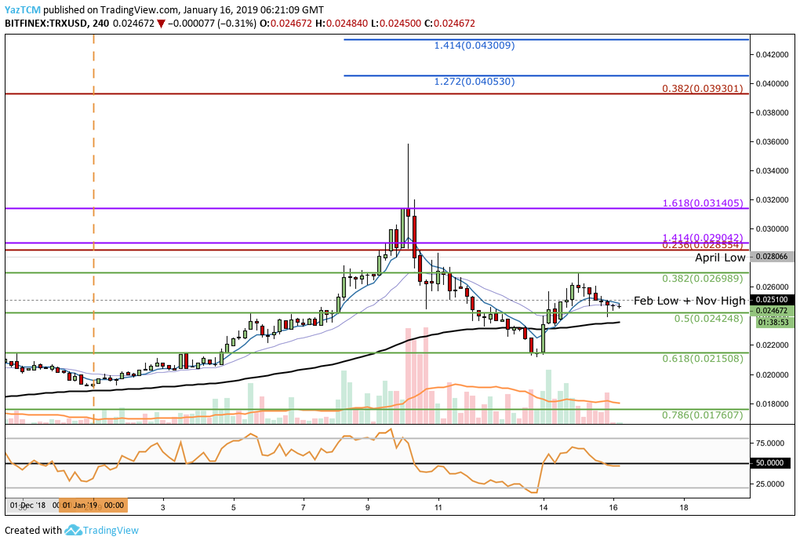 Analzsing TRX/USD from the 4-hour perspective shown above, we can see that 2019 has been a decent year so far for TRON. The market had managed to surge during the first 2 weeks of the year, hitting a high of $0.03584 on January 10, 2019. However, we can see that on the 4-hour chart, price action was unable to close above the resistance highlighted by a short-term 1.618 Fibonacci Extension level (drawn in purple) priced at $0.03140. It may also important to note that on the daily chart for TRX/USD, the market was unable to close above the resistance at the bearish .236 Fibonacci REtracement level (drawn in red) priced at $0.02855. This Fibonacci Retracement level is measured from the high of $0.0845 seen on May 21, 2018, to the low of $0.011 seen towards the end of November 2018. After reaching this area of resistance, the TRX/USD market rolled over and began to fall. The market continued to decline until reaching support at the short-term .618 Fibonacci Retracement level (drawn in green) priced at $0.0215. After hitting this area of support the market bounced, once again. Price action then went on to rally but met resistance at the short-term .382 Fibonacci Retracement level (drawn in green) priced at $0.02698. Since hitting this resistance, the market has fallen and is now trading at support at the short-term .5 Fibonacci Retracement level (drawn in green) priced at $0.02428. As the market is trading within a range between $0.02698 and $0.02150, the market trading condition is neutral. If price action was to break above the range, the condition would be bullish in the short term. If price action was to break below the trading range, the trading condition would be bearish in the short term. Where is the Resistance for TRX Above the Trading Range? If the bulls can press on higher and cause TRX/USD to break above the upper boundary of the trading range at $0.02698, they will meet initial combined resistance at the $0.028 handle. This area contains the April 2018 low priced at $0.02806 and the bearish .236 Fibonacci Retracement level (drawn in red) priced at $0.02855. If the buyers can continue to break above the $0.028 handle and continue on above $0.030, there will be more resistance towards the upside at the short-term 1.618 Fibonacci Extension level (drawn in purple) priced at $0.03140. Further resistance above this can then be located at the bearish .382 FIbonacci Retracement level (drawn in red) priced at $0.03930. This is followed by the medium-term 1.272 and 1.414 Fibonacci Extension levels (drawn in blue), priced at $0.04053 and $0.04300 respectively. Where is the Support Beneath the Market? If the bears begin to push price action lower again, we can expect initial support below to be located at the short-term .5 and .618 Fibonacci Retracement levels (drawn in green), priced at $0.02424 and $0.02150 respectively. If the sellers continue to drive price action below the trading range, then we can expect more support to be located at the $0.020 handle. This is followed by the short-term .786 and .886 Fibonacci Retracement levels (drawn in green), priced at $0.01760 and $0.01488 respectively. TRON continues to gain market reach as it is added to more and more exchanges each month. The market will now need to break above or below the current trading range before we can estimate which direction the market will head towards next.